“One round of blindfolded dodgeball and you are bonded for life!” Isn’t that what friendship is all about? 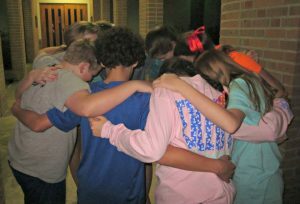 Being bonded to Christ, above all, and each other. The St. Mark’s Youth Group meets Sunday for afternoon bible study, worship, small groups and fun to build friendships on a firm foundation. Every month we have at least one large, fun event on or off campus. Some examples are: Movie Nights, Hot Hearts Concert, Messy Game Night and, one of our favor ites, Aliens! Friends are always welcome!! Service and Outreach, both at home and away, give meaning to our lives as we strive to be the hands and feet of Christ. The Diocese of Texas sponsors missions and retreats like Missionpalooza, Y.E.S. and Happening Retreats, among others that we are actively involved in. At home you will find the Youth Group waiting tables at Chili Supper, flipping pancakes for Shrove Tuesday Supper, helping with VBS and leading the liturgy for La Posada and the Stations of the Cross. In summer we go on a beach trip to Florida with hundreds of other Christian youth from around the country. Our faith is hands on and hands together, whether it’s serving our own church family or building a shed for other families far away who have lost everything in a tornado.